Archelon, the giant turtle was a well known name in the reptile family. It was seen floating in the ocean after is free will during the Cretaceous period, 75 millions ago. It was a very slow mover and was seen drifting along the sea coast in search of food. The turtle grouped in the reptile family had an incredible size, 4.6 meters. Its beak was so strong that it could easily break the shell of an organism however strong it might be. The life span of the turtle was more than a century. 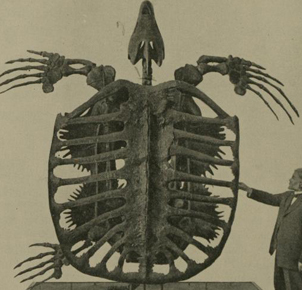 The first remains of such a giant sea turtle Archelon were discovered by D. Wieland in the year 1895 near South Dakota . It is assumed that the closest relative of this giant turtle that are carrying the flag of ancient dexterous courage is the Leatherback turtle. Most of the remains of the ancient giant turtle were found near South Dakota . It had again the very similar features of the ancient giant turtle Protostega Gigas but it is assumed after a thorough study that the Archelon was much larger in size that of it. With the aid of the long flippers the Archelon could float and swim on the sea after its own sweet will. I had the power to swim long distances with the help of he flippers. It always roamed in the sea escorted by a large number of other fish that preferred to swim along with it. The Archelon was gigantic but it did not know how to combat well, how to defend itself in the face of an open attack. It never used to draw its head back or the helpful flippers within its shell. It moved in a flamboyant style without caring the sudden attack of the larger predators like the sharks.